Food Trucks in the Historic District? From Vendingtruck.com, one of the many examples of their work. 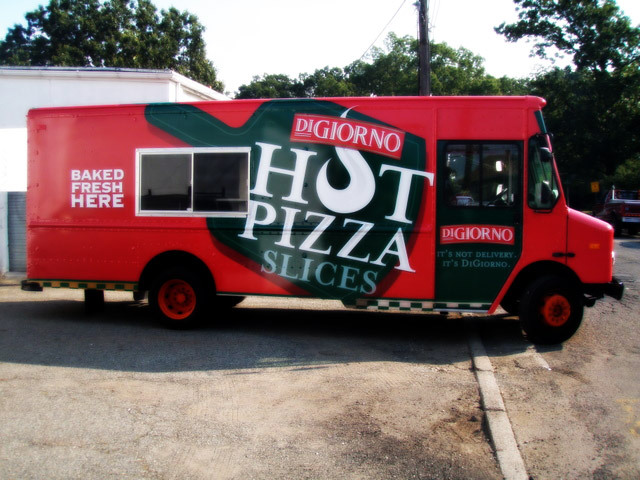 This is a Di Giorno pizza food truck they created. There was an application to the Saugerties Historic Review Board to place a Taco & Burrito food truck in the district, with picnic tables and rainbow colored umbrellas. There are no Village laws regulating food trucks, so it fell to us to decide. This is how we dealt with it. I am a fan of food trucks, and know they are a National fad. However, I do not believe that there is a place for them in our Historic Business District (an 8 block, 25+ year-old well-preserved 19th century commercial district on the National Historic Register.) We will lose existing parking spaces and add congestion, just to gain access to good fast food in a neighborhood that already has ten storefront fast food places within one block, and seven more just a half block further. In addition, the grocery across the street from the proposed food truck location has their permits in place to begin selling similar fast food as soon as June. That’s 18 fast food purveyors, total, in a 2 block area. All of them pay rents and/or mortgages, salaries and have a vested interest in preserving the historic character of our district. I believe we should require a temporary business to follow the same rules the permanent businesses do. The Historic Review Board determined that Food Trucks are to be treated as temporary signs. We already have jurisdiction over temporary signs such as sandwich boards and mobile signs, even signs on wheels. We could require the same design, color & lettering requirements on the truck as we would on any sign. We could treat the umbrellas as awnings, or as we did with other outside umbrellas, and require muted colors. Issues of congestion and safety, and of the interests of established businesses already complying with the laws of the Historic District, while real concerns, are not our purview. The criteria for food trucks is that they be parked off street in side yards, as defined in the zoning ordinance, not in a front yard as defined by the zoning ordinance, and not in front of businesses or between businesses and the street, that they be treated as temporary signage, which is removed when the business of the truck is not open, with the same design, color & lettering requirements on the truck as on any sign, and any umbrellas, awnings, etc. be of approved color and design consistent with our awning policy. There are at least 5 locations in our 8 block Historic District that meet those criteria. The truck is considered a temporary sign. There are no flashing lights allowed. The truck will be parked on the west side of the property, next to the neighboring building as per attached schematic drawing*. Umbrellas will be solid color green and/or red to match the color of the stripes on the truck. The number of tables and umbrellas are up to the owners, but will not exceed the area noted on the above drawing. *In total, three parking spaces are allotted to the food truck. All are on private property. The truck is not visible from most of the district, but the umbrellas are. I believe the Historic Review Board reached an equitable compromise. What do you think? This entry was posted in Culinary, food, Food Fads, historic preservation, Pop Culture, tourism, Uncategorized and tagged business, cooking, culinary, food, food trucks, Historic Business District, historic preservation, Historic Review Board, history, Hope Farm Press, New York State, problems, temporary signs. Bookmark the permalink.